Critical Approaches to Comics offers students a deeper understanding of the artistic and cultural significance of comic books and graphic novels by introducing key theories and critical methods for analyzing comics. Each chapter explains and then demonstrates a critical method or approach, which students can then apply to interrogate and critique the meanings and forms of comic books, graphic novels, and other sequential art. The authors introduce a wide range of critical perspectives on comics, including fandom, genre, intertextuality, adaptation, gender, narrative, formalism, visual culture, and much more. 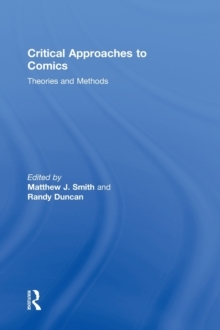 As the first comprehensive introduction to critical methods for studying comics, Critical Approaches to Comics is the ideal textbook for a variety of courses in comics studies. Contributors: Henry Jenkins, David Berona, Joseph Witek, Randy Duncan, Marc Singer, Pascal Lefevre, Andrei Molotiu, Jeff McLaughlin, Amy Kiste Nyberg, Christopher Murray, Mark Rogers, Ian Gordon, Stanford Carpenter, Matthew J.